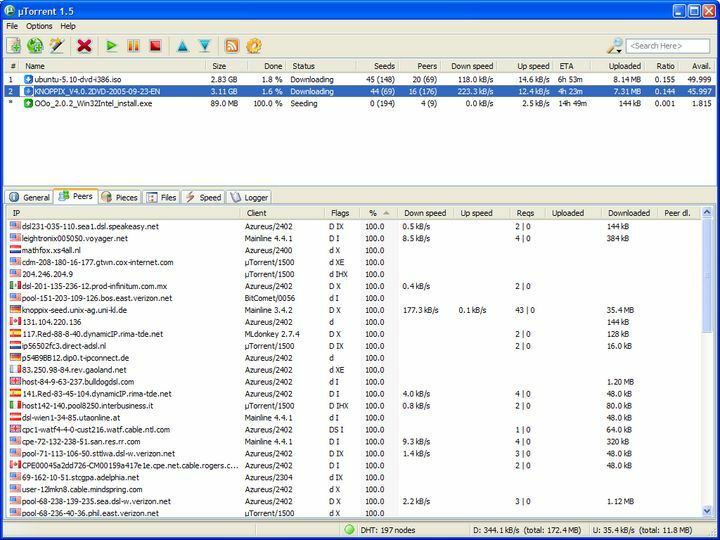 µTorrent (or uTorrent as it is also known as) is an efficient and feature rich BitTorrent client for Windows, sporting a very small footprint. It was designed to use as little CPU resources, memory and space as possible while offering all the functionality expected from advanced clients. Some of the features include: Multiple simultaneous downloads, Smart bandwidth usage, File level priorities, Configurable bandwidth scheduling, Global and per-torrent speed limiting, Quickly resumes interrupted transfers, UPnP support (WinXP and later only), Supports popular protocol extensions, Localized to different languages, typical memory usage is less than 4MB. Currently using 3.1.2, works great. Some sites are banning newer versions though for improper stats reporting, which could get you banned as well. Do your homework. Version 3 does not allow you to see or select files until after the download starts. V2.2.1 build 25249 does and I had to get the old version from a different site because this site seems to default to version 3 regardless of what version you want. if there ever was a ratio of CPU footprint to usefulness/effective/impact, uTorrent would win that contest with ANY application. It has the footprint of Notepad, yet it has all the features and the ability of a 3 old videostores ...combined! Vanha ja vakaa oikea Torrentti !! Paras torrenttien latausohjelma. Ulkoasu on hieno ja yksinkertainen. Ohjelma on kevyt kuin höyhen ja toimii kuin unelma. µTorrent on kyllä paras BitTorrent -ohjelma mitä löytyy! Kevyt kuin höyhen, ei bugeja ja samat ominaisuudet kun raskaammissakin BitTorrent-ohjelmissa! Loistavaa! If you can nab 1.6 Grab it. i've compared the apples with apples and 1.6 beats the new version hands down. the new version is ok but they stripped the good stuff. Loistava! Ilmainen, helppo, nopea, pienikokoinen, kaikki tarvittava löytyy, mitä muuta tässä voisi sanoa! :D Parempaa ei ole eikä tule. Only BT client that works or me! It would seem that getting the latest version of any given software isn't always the best option. I had upgraded from µTorrent 1.6. I'm not saying this didn't work at all, just that no matter how many times I changed them it would ignore any personal settings that I would make. After many attempts I just finally gave up and went back to 1.6. The old 1.6 up to 1.7.6 versions were sufferable to a remote crash attack so they encouraged everyone to upgrade to v1.7.7+ So, I encourage you to get Peer Guardian with this program and it will alleviate your concerns that v1.6 is the best. It's a good version of utorrent, but if your concerned with privacy I say go with Peer Guardian along side this. How is 1.6 safer than the latest release? The ip's mentioned in the entry below are all currently in range of the ipfilter.dat so as long as that is being used in uTorrent, they are blocked anyway. µTorrent said themselves they didn't discover anything, they just heard from a guy that heard from a guy. Ugh ... ridiculous. <br/> <br/>Ridiculous perhaps but better safe than sorry based on the more informed posts in this thread (of which I'm obviously not a part of.). So, I guess the jury is out and this is their answer or is it? So is all of 1.6.1 DRM free? Stay with 1.61 for sure! It'll try and get you to update but click cancel. Don't download. Go back to 1600. It is safer. uTorrent is CLOSED source. It can not be trusted. Bittorrent Inc. has bought uTorrent, beware. Use at own risk. To be even safer, switch to Azureus. µTorrent is great...does anyone know when the next stable is expected? uTorrent 1.6 ** DRM-Free ** <br/> <br/>Hollywood bought up the official BitTorrent client and destroyed it. <br/> <br/>Later, BitTorrent bought up uTorrent. <br/> <br/>They're planning to implement DRM and all sorts of crap in all of the major torrent clients, including uTorrent and Azureus... <br/> <br/>The last good (and safe) client to use is uTorrent 1600 (1.600) which was released before they sold out to hollywood and BitTorrent... but it's getting harder and harder to find it, so here's the file containing the 1600 setup. PR, Thanks for the heads up on the utorrent issue. I will be removing the 1.7...and going back to the 1.6 stable..
Utorrent 1.6 Standard, the last final build, was done before the company was purchased and the new code written. That version should be safe I believe and is still an excellent client. The fact that Utorrent is now owned and being updated by people that have signed agreements with the RIAA and MPAA and NOT the original programmer, should give anybody pause. If you wish to use Utorrent, I'd simply say stay with the 1.6 Standard final version and do not use anything after that release. I for one do not wish to support ANY effort by someone so chummy with the RIAA and MPAA, period. I don't see why anybody would want to, especially with the original author no longer coding the program. He cashed out and he's done. Whatever happens from this point forward is no longer something he's involved in, I believe. If the RIAA and MPAA can't kill 'em, they buy 'em and reprogram them. Bearshare, Utorrent, what's next? They are letting their money do the fighting for them and have ruined what was a fantastic product. Too bad it wasn't made Open Source so someone could continue on the work in the right way. The backlash against Utorrent is not FUD. Simply looking at who bought the program and who is now updating the code should be enough to convince anybody that the Utorrent we knew is gone. 1.6 Standard is the last REAL version of Utorrent. Anything after that is suspect. This software is excellent. Great improvements especailly when u can limit the speed of uplods. I love it. If the file is an image file u would need programs like Nero or DVD Decrypter or imgburn to put it on a disc. I started using utorrent about a month ago and it is excellent! Especially once you foward a port on your router. I get incredible speeds and it is very easy to use. I don't see myself ever using any other client. Works well, have used other clients before and this one is by far the best and doesn't take up a lot of space to run. Best bittorrent client there is. For Java based Azureus is the biggest memory hog. About the only thing it offers utorrent doesn't and won't is plug ins which is hardly a big deal.